Hi Friends! Black Faun Gallery will host an art opening for me called Art of Illuminated Flow, this Sat the 4th, coinciding with the ArtsAlive walk from 6-11. 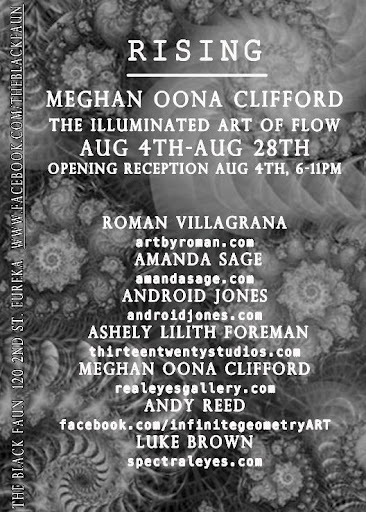 I’ll be showing Illuminated Portraiture and my Alignment/Flow series, plus an animated video piece. Originals, prints, organic clothing, free gifts, and more! The Strawberry Sangria will be flowing so come on by to celebrate! Hello there! I can see that you undoubtedly understand what you are speaking about here. Do you have a degree or an education which is linked with the subject of this entry? Can't wait to see your reply.